I can’t believe that next week will be June already!! (and my birthday) We’re getting into the final 3-month countdown for the wedding, and it’s about to get real! My family is having a wedding shower for me this Sunday, my first one!! I’m excited and nervous – I can’t wait to see everyone. I think it will be the first real ‘I’m the bride’ moment! After saying ‘yes to the dress’ – of course, which I said yes last year. And now, i’m waiting impatiently to wear my dress. Adam and I have been engaged for over a year now, and i was thinking how happy i am that we decided to wait until the following september, instead of last year. I’ve really enjoyed being engaged, getting to prolong the engagement activities, and really enjoy all of the events – with much longer to plan and create them. I’m sure the next few months will go by quickly, but I’m so happy we get to spend this time together before we get married. Now, for the bars. 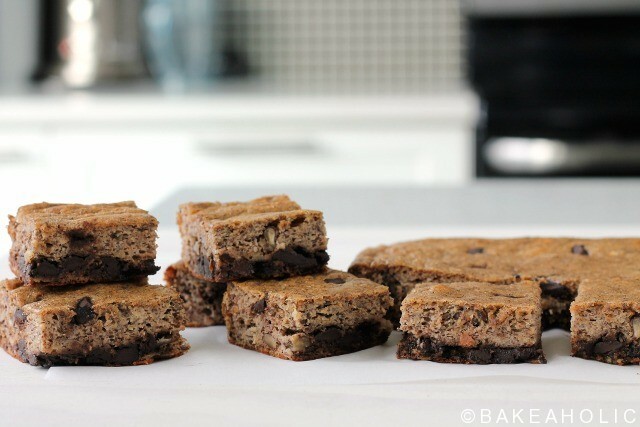 I made these as a banana-version of my pumpkin chocolate chunk bars, and they are SO good. 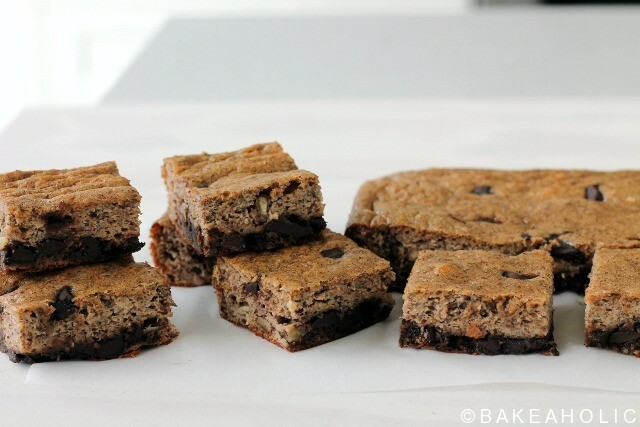 Like a light snack cake version of banana bread, studded with dark chocolate. Plus, there’s not gluten/wheat in it, or any wheat-alternative, and no butter or added sugar. I like them straight out of the fridge, for a cooler snack on a warm day, when the chocolate pieces have hardened up for a little chocolate crunch. i chopped up chocolate, and they heavier pieces sunk to the bottom as it baked – it created a black-bottomed banana bread, which was Delicious!! You can also throw in some walnuts if you have em, or almonds chopped up. 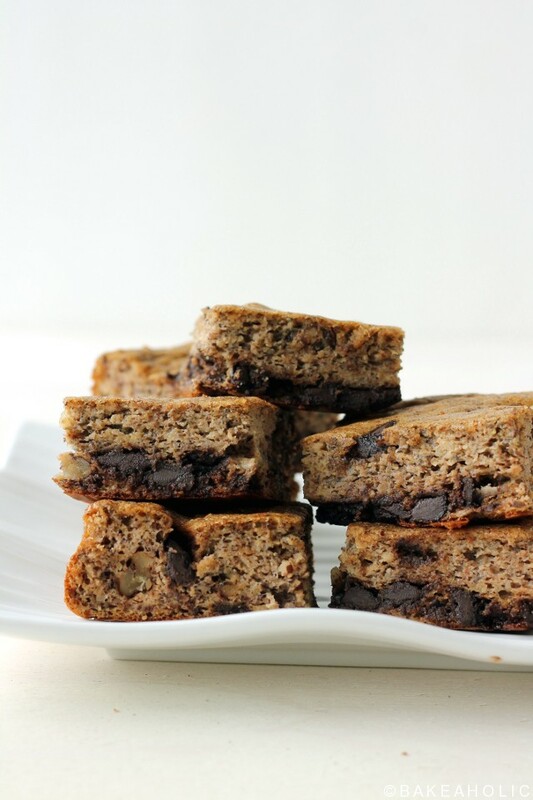 A fluffy, light banana bread bar made with no flour or added sugar. Perfect for snacking, or dessert. Preheat oven to 350 and line an 8x8 baking pan with parchment paper, or spray with coconut oil. Combine all of the ingredients in a medium sized bowl and blend with handheld beater or standup mixer until well blended. Add in the chocolate chips and fold using spatula. You can sprinkle chocolate chips on top if you like as well. Transfer the batter to the prepared baking dish, and bake at 350 for 25 minutes, until edges are brown and toothpick inserted comes out clean. Allow to cool completely in the pan, then remove, cut and serve. Best kept on countertop, can be refrigerated. Can be refrigerated, or left on counter covered for 3-4 days.